Albi Cathedral, formerly the Basilique Cathédrale Sainte-Cécile d’Albi, is a monumental brick church in Albi, Southern France. First built as a fortress in 1287 and under construction for 200 years, it is claimed to be the largest brick building in the world. In 2010 the cathedral was designated a Unesco World Heritage Site. 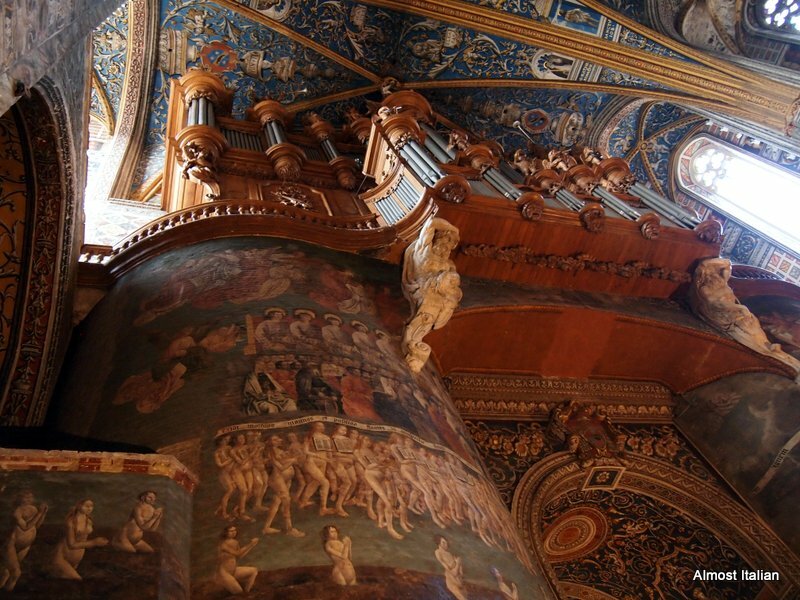 The interior of this church is most striking. 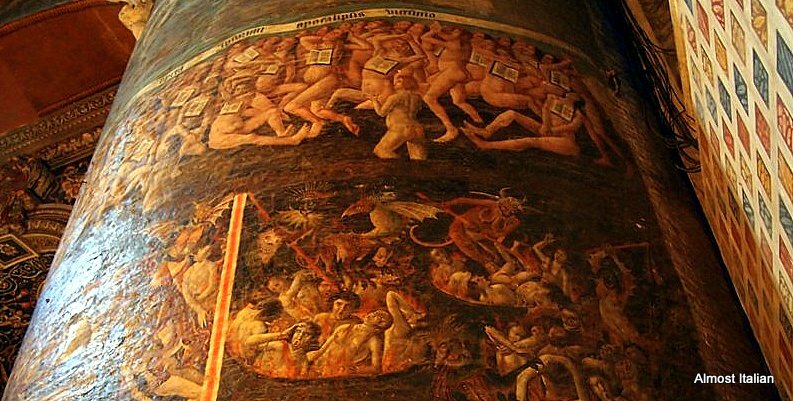 Unlike the foreboding exterior, the inside is fantastic (literally), with Renaissance painted frescoes on the ceiling, Southern Gothic sculpture, filigree stone work, and the scariest of all, the Flemish painted fresco of the ‘Last Judgment’, enough to convert any happy, illiterate pagan. Although I am allergic to religion, I do enjoy visiting the interiors of churches and temples around the world and thank Ailsa of Where’s My Backpack for the chance to revisit this one. It’s one of my allergies too, Francesca! But the art and architecture that religion has produced are spectacular. 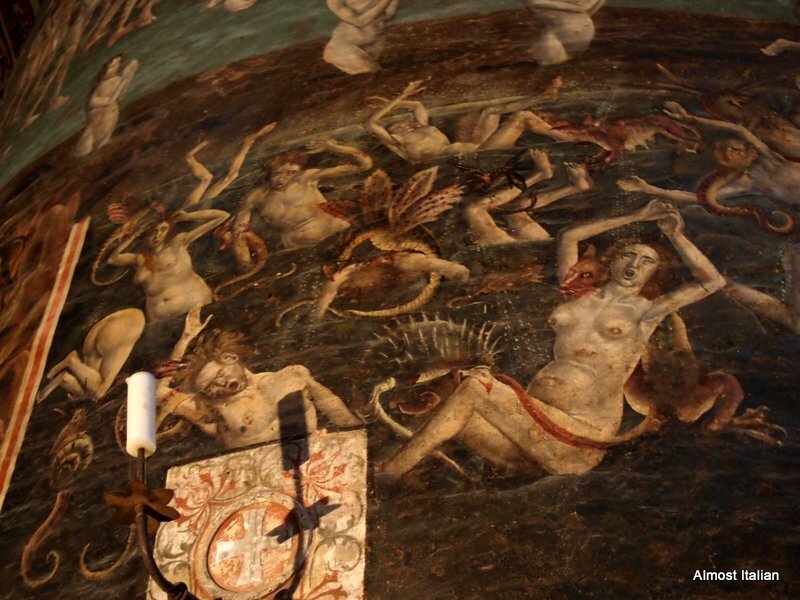 One look at those frescos and you would obey!! Yes, or straight to hell you go! Ditto re. allergies. However, like you, I adore looking at fantastic places – the art and history are spectacular. Those painted vaults are wonderful – love the blue backgrounds. It is a cathedral that isn’t on everyone’s visit list in France- but should be- quite amazing. Quite fantastical! And rather terrifying now I look at the details…. It is quite frightening, and yet the detail is superb. 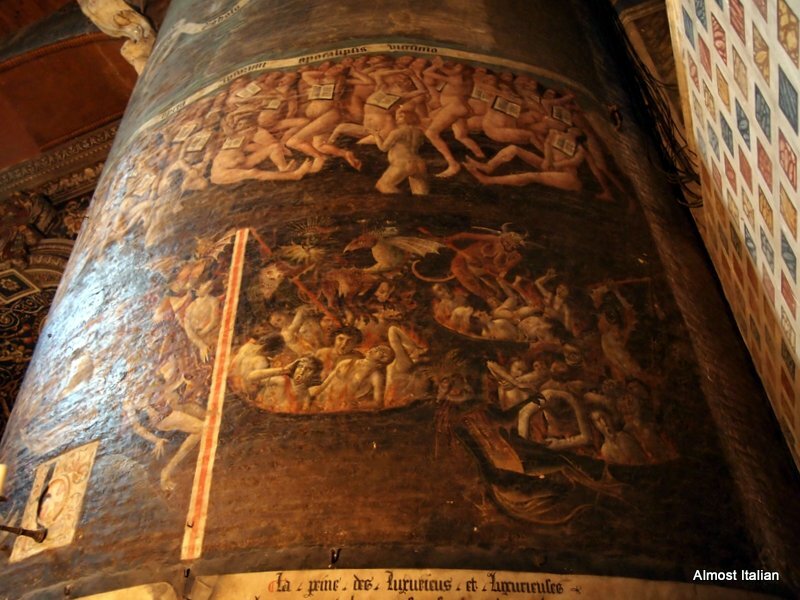 Like you, I love visiting the interiors of churches, cathedrals etc… This looks interesting! Like you I am not religious. But 2 of my favourite things are stained glass windows and church graveyards. We were in Albi last year and visited this Cathedral. The detail is truly spectacular. I’m not sure if it’s the largest brick building in the world. We were told it was the highest all-brick Cathedral in Europe. I’m rather partial to graveyards too. And stained glass windows. Love them in Chatres Cathedral especially. Gorgeous photos Francesca. I love religious art, architecture, music, but I share your allergy…..
It’s odd, so many of us do share that allergy, whilst being quite open and responsive to personal spirituality and social justice. I’m not one for religion really but there are some spectacular works in the name of it! LOL! I am allergic to religion too and also really enjoy visiting churches, temples etc. The art and architecture together is so stunning. Big cathedrals are so hard to photograph, so well done with the photos! Previous Previous post: Outback Camp Kitchen: a New Approach. Next Next post: Spring on a Plate. Cucina Povera.